Retallack continues to focus on breeding big, long, bulky sheep with good hindquarters and a dense, heavy fleece ensuring clients receive maximum profit for both meat and wool. Emphasis is placed on eye muscle area, leanness, milking ability, growth rates and fertility with all sheep sold with across flock and in-house Estimated Breeding Values (EBVs). We regularly attend lamb markets and first cross ewe sales to keep abreast of the industry, with the biggest and bulkiest sheep making the most money. 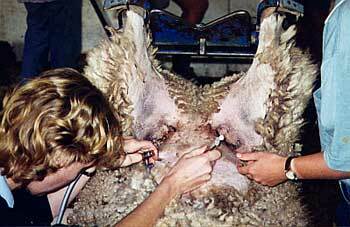 To this end, we continue to breed the type of sheep required in the sheep and lamb industry today. Our commercial clients are being rewarded for using professionally produced flock rams with all the traits to receive top dollars from their progeny. Retallack sires have played a major role in increasing our clients lambing percentages, with clients recording up to 150 per cent at lamb marking. The Border Leicester continues to be an invaluable breed in the meat and wool industries and is recognised as an ideal maternal mother or preferred sire over Merino ewes to produce first cross ewes. An extensive AI program is carried out each year in the first week of March. Two groups of ewes, 300 and 200 respectively are AI'ed to top Retallack genetics. The remaining breeding ewes are hand mated and paddock joined over a period of 10 weeks. Phillip Island, best known for penguins and car racing, is home to the diversified farming enterprise of the Jeffrey family, and its dedicated 92-year-old matriach, Mollie Jeffrey. Taking up the new challenge with enthusiasm, it wasn't long before she was exhibiting her Border Leicesters at the Melbourne Show, a pasttime she continued with success for the next 25 years. It was during a visit to the Melbourne Show that she first identified Retallack sheep as having the characteristics and quality she wanted for her stud, purchasing her first ram in 1982. Numerous visits to Ariah Park by Mrs Jeffrey and her husband followed over the years, developing a valued association with Retallack and its principals, Graham and Isabella Grinter. Mrs Jeffrey appreciates Mr Grinter's ongoing interest and assistance. "I am very particular, Graham picks rams for me he knows I will like, I trust his judgement," she said. With nearly 30 years of Retallack genetics in her flock, Mrs Jeffrey continues to be impressed with the quality and soundness of the sheep, praising their constitution, an important trait in a tough environment where "weedy lambs won't survive." Others are impressed with the "Quoin Hill" Border Leicesters too, with a reputation that continues to attract repeat buyers and interest from across Victoria for the 40 to 50 flock rams sold each year. Retallack has figured strongly in her long and rewarding association with Border Leicesters and quality sheep production. "Retallack sheep are the best boned Border Leicesters I have ever seen, they are proper sheep, structurally correct and big. "The tops of the Retallack rams are 'top of the Border Leicester tree' and the number of rams offered provides buyers with a great selection. "Even if you don't get the top pen at the Retallack sale, you know you are still buying the best selection of rams around." In 2003 at the Special Breeders sale in Echuca, Mr Allan topped the market with 6-7 month old ewes, sired by Retallack rams, selling to a top of $164, a new venue record and possibly an Australian record at the time. Mr Allan says that without a doubt, the use of Retallack rams in his breeding program has played a significant part in the overall profitability of his flock. Mr Jarick said he has always been keen on Border Leicester's and found Retallack stud manager, Graham Grinter extremely helpful. I have watched Graham's sheep develop over the years to become the benchmark of the industry, said Mr Jarick. Graham is switched on with the industry's needs and Retallack genetics are in line with the direction the sheep industry is heading. Mr Jarick said buying a ram from Graham didn't mean that was the end of your dealings with him. Graham would have to be one of the most helpful blokes around. He takes an interest with all his clients; he offers the complete package. Mr Jarick said it was important to be in tune with the prime lamb industry and it was encouraging to see Graham keen on helping the prime lamb industry grow and breed quality over quantity. Boorowa based mixed farming operator Tim McGrath runs 6000 Merino and crossbred ewes on his 2500 acre property "Hopefield", just east of Boorowa, along with 100 breeding cows. Tim now retains the first cross ewe portion from his Merino/Border Leicester cross, that in the past he had sold until the current prices offered to good an incentive not too. He puts 800 to 1000 acres of grazing Oats and Triticale in to finish lambs and produce feed for ewes and the balance of his sheep and cattle. Tim turns off second cross lambs - where 300 of the tail end sold in Wagga saleyards at the end of July for $119, while a truck load of Merino wethers off crop returned tops of $128 at the start of July. The second cross lambs are reaching 128% lambings and his Border Leicesters over his Merinos are always over 100%. In good years like this 60 to 70% of his first cross ewe lambs are able to be joined at 10 months of age with no worries at all he said. Tim has been using Retallack Border Leicesters for over 20 years to put over his Merino flock. "I like the consistent progeny the rams give me - they are all like peas in a pod, they mature early to allow me to join earlier and get that extra lamb out of them by the time they are two year old," he said. "The crossbred's give me options and the Border's offer me the versatility I need to either retain half of the progeny as first cross ewes or chop their heads off as they are good enough quality to draw big money at the saleyards." The swing in the lamb markets and even prices for old ewes has made the crossbred job so much more attractive and lucrative as a cash flow to farmers."